The activities surrounding the Al Aman Group and its subsidiary, the Al Aman World Capital Centre (WCC)—the proposed “tallest building in Asia,” to be built in Colombo—are rife with suspicion. Al Aman signed a USD $2 billion agreement with Sri Lanka’s Board of Investment (BOI) on June 30, 2017 to build the super-skyscraper in Colombo. The alarm bells sounded early. Al Aman bills itself “a globally renowned chain with its operations spread across the world.” However, investigations by the Daily News found that there are no records of Al Aman offices outside of Sri Lanka except for one in the United Arab Emirates, with a phone number that is out of service. The investment into Sri Lanka is billed as a Foreign Direct Investment (FDI). However, the group’s head office is located in Sri Lanka. Repeated attempts found no projects that have been completed by the group. All future projects of the subsidiary, Al Aman WCC, are listed within Sri Lanka, despite the company boasting of an international portfolio. These projects include Aman 101-Royal Empire and Aman Royal Island, both to be built in the north of Sri Lanka, in addition to the proposed World Capital Centre. The Group boasts ownership of seven other companies in addition to the Al Aman WCC, including a consultancy and a media corporation. However, none of these companies exist with any sort of paper or digital trail except on a single website, www.alamangroups.com, which is seemingly a hurried construct. On that website, Al Aman presents contradictory claims: that its business has been around for “five generations,” and that it was founded in 2001. Already confounding, a search of the history of Al Aman World Capital Centre (WCC) Ltd. reveals that it was not incorporated until 6 October 2015. And these same records reveal the company was dissolved earlier this year, on 14 March 2017. When the Daily News revealed this to Board of Investment Chairman Upul Jayasuriya, he said this was the first time he was hearing of the discrepancy with the dates. The Daily News is yet to confirm if the holding company or any other of it subsidiaries are registered in Sri Lanka, the location of its head office. The proposed location of the WCC is also questionable. Al Aman has repeatedly, in responses from its verified accounts to inquiries on social media, claimed that WCC will be based in Colombo 2; in its press releases, however, Al Aman has stated that a location for the super-skyscraper is yet to be determined. But when the Daily News contacted the Colombo office of Al Aman, a spokeswoman who would not reveal her name said the location has already been identified, and gave a precise address in Colombo 4: No. 60 Davidson Road. This space is currently occupied by a UAE-based technology company, which told the Daily News in a phone interview that it has no plans to evacaute the premises. Asked when construction would begin, the same Al Aman spokeswoman responded, “Next month,” even though Al Aman has only brought in US $2 million of the US $200 million required for the BOI not to terminate the project, according to the Board of Investment (BoI) of Sri Lanka. Then there are the forged photos Al Aman has been using to publicize and promote the construction of the WCC. 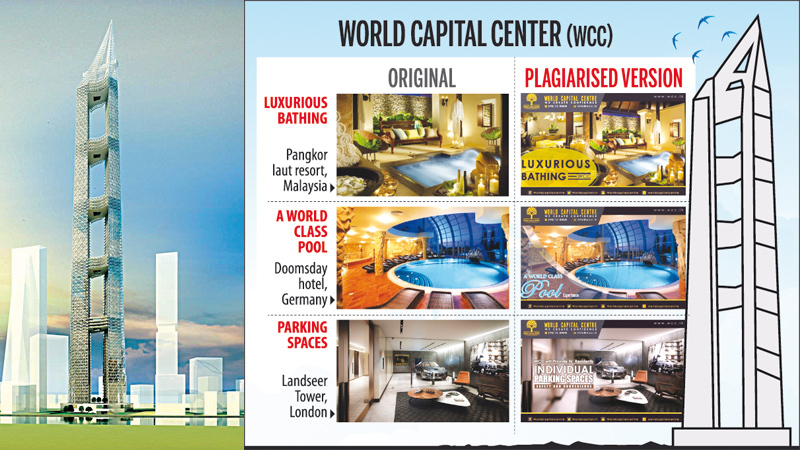 All over its social media accounts and website are graphics with text overlays containing promises of amenities and features the WCC will have. But investigations by the Daily News revealed that the photographs in the graphics have all been plagiarized or borrowed from elsewhere. The photo of its individual indoor car park is from “The Landseer,” a residential development in London. Its spa is that of the “Pangkor Laut Resort” in Malaysia. Its pool is from an underground doomsday-themed bunker hotel in Germany. Even the photos it uses to forecast what the city's skyline will look like once the WCC is built are plagiarized—not images of Colombo but of Bangkok and Dubai. A real estate expert in Colombo emphasized that any real project close to the proposed scale of the WCC would be creating its own mockups to attract investors rather than forging them. The claims made by the company regarding the proposed construction are also suspect. At various instances, Al Aman has insisted that the WCC will be the ninth, seventh, fifth, and third tallest building in the world upon completion. No building that the Daily News is aware of can occupy all those titles at once. Al Aman representatives also boast that the WCC will possess a ten-star hotel, a classification which currently does not exist, as well as a Michelin-starred restaurant, a classification which cannot be guaranteed. 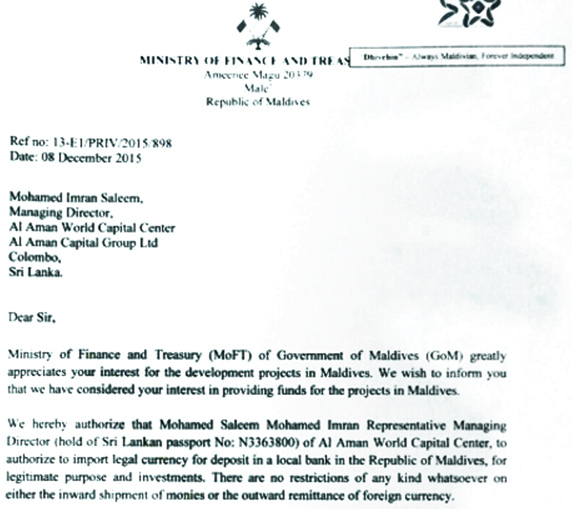 The Daily News could find no projects under the Al Aman Group or its holding companies in the Maldives. Foreign governments and agencies include Sri Lanka's and its BOI. In an interview, the Daily News asked BOI Chairman Jayasuriya if he was concerned about the letter, which ostensibly allows the Al Aman Group to export to the Maldives any money it brings into Sri Lanka for investment in the WCC project—which is currently BOI-certified—and shelter it, indefinitely, in secret. He responded, as he did repeatedly throughout the interview, that the BOI had to give Al Aman the benefit of the doubt. When the Daily News asked Jayasuriya if he was concerned that a fraudulent project endorsed by the BOI via a USD $2.4 billion signing agreement could jeopardize the country's ability to attract future FDI, he responded, “The best that we can do it just to wait and see."